Cell Reports 2018 Nov 13;25(7):1772-1785.e6. doi: 10.1016/j.celrep.2018.10.059. (1) Thpo facilitates Mk-lineage differentiation through mitochondrial activation in HSCs. (2) Mitochondria-rich HSCs exhibit Mk-lineage differentiation. (3) Mitochondria-associated pSTAT3 is involved in mitochondria activation via Thpo signaling. During acute myelosuppression or thrombocytopenia, bone marrow (BM) hematopoietic cells respond rapidly to replenish peripheral blood platelets. While the cytokine Thrombopoietin (Thpo) both regulates platelet production and maintains HSC stem cell potential, whether Thpo controls megakaryocyte (Mk)-lineage differentiation of HSCs is unclear. Here, we show that Thpo rapidly upregulates mitochondrial activity in HSCs, an activity accompanied by differentiation to an Mk-lineage. Moreover, in unperturbed hematopoiesis, HSCs with high mitochondrial activity exhibit Mk-lineage differentiation in vitro and myeloid lineage-biased reconstitution in vivo. Furthermore, Thpo skewed HSCs to express the tetraspanin CD9, a pattern correlated with mitochondrial activity. 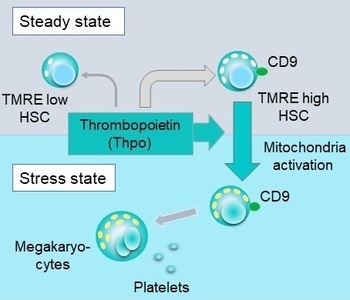 Mitochondria-active HSCs are resistant to apoptosis and oxidative stress upon Thpo stimulation. Thpo-regulated mitochondrial activity associated with mitochondrial translocation of STAT3 phosphorylated at serine 727. Overall, we report an important role for Thpo in regulating rapid Mk-lineage commitment. Thpo-dependent changes in mitochondrial metabolism prime HSCs to undergo direct differentiation to an Mk lineage.